Purpose The evaluation of the long-term outcome of the arthroscopic remplissage performed in addition to the classic Bankart repair for the primary management of recurrent anterior shoulder instability with engaging Hill–Sachs lesion without inverted pear appearance of the glenoid during arthroscopy. Methods During a 6-year period, from 2007 to 2012, 65 patients whose average age was 30.1 ± 7.6 years were operated on in our department and satisfied the inclusion criteria of this study. They all had a positive apprehension sign preoperatively. Among them, 51 patients (82%) were available for long-term evaluation. The mean follow-up period was 8.1 ± 1.8 years (range 5.6–10.6). Results Three patients (5.6%) had suffered a new dislocation. The remaining patients (94.4%) were satisfied with the surgical result and returned to their previous daily activities, whereas 71% continued to participate in sports without restrictions. The ASES score increased from 72.5 (range 18–100) preoperatively to 100 (range 85–100) postoperatively (p < 0.01). The modi-fied Rowe score increased from 40 (range 15–70) to 100 (range 70–100) (p < 0.001), and the Oxford Instability score from 29 (range 9–47) to 48 (range 36–48) (p < 0.001). No significant restriction in the shoulder range of motion was documented. Conclusions The combination of the arthroscopic remplissage with the classic Bankart repair was proven to be a safe and effective procedure for the treatment of “engaging” Hill–Sachs lesions without inverted pear appearance of the glenoid. This combination has long-term outcomes in terms of the recurrence rate and does not significantly influence the range of motion of the shoulder. Introduction“Remplissage” is a French word that means “fill in the gap by folding something”. This term was first proposed in 2008  for describing the concept of the procedure, which entails a capsule-myo-tenodesis of the posterior capsule and the infraspinatus tendon within the Hill–Sachs lesion. Thus, the humeral articular bony defect becomes extra-articular, eliminating the engagement of the Hill–Sachs lesion with the anterior glenoid rim, thereby decreasing the possibility of recurrent instability . There are many prognostic factors affecting the possibility of a recurrence , but the prevalence of bone defects is considered one of the most important . Burkhart and De Beer highlighted the importance of bony defects and their contribution to recurrent shoulder instability following soft tissue procedures. They introduced the concepts of the “engaging” Hill–Sachs (HS) lesion and the “inverted pear” aspect of the glenoid . 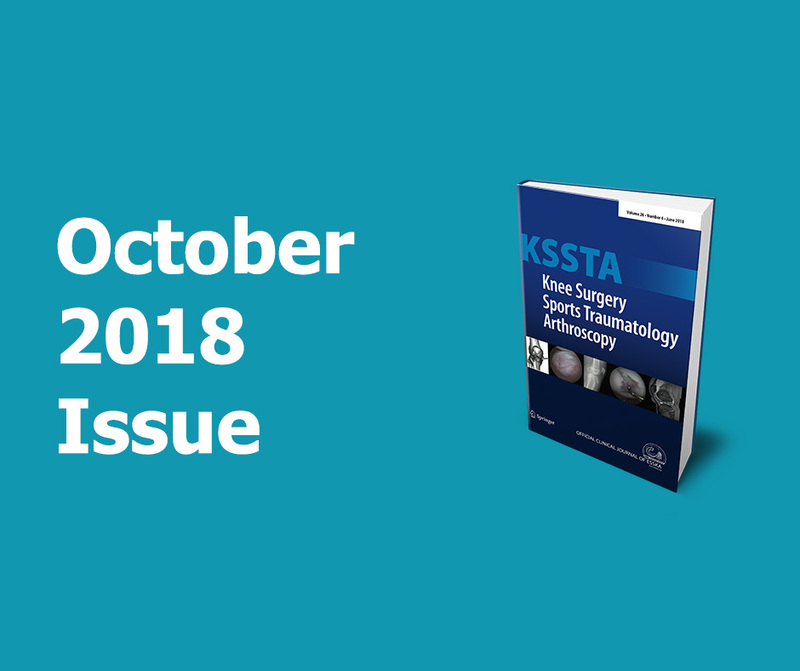 The concept of the glenoid track  and the evolution of our under-standing from engaging Hill–Sachs lesions to on-track/off-track lesions  further enhanced the role bone defects play in the failure of arthroscopic shoulder stabilisation procedures. The topic remains controversial until the present [8, 9]. The aim of this study is to evaluate patients who have primarily undergone arthroscopic remplissage in addition to the classic Bankart repair for the management of recurrent anterior instability in patients with “engaging” Hill–Sachs lesions without an inverted pear appearance of the glenoid during arthroscopy. We attempt to investigate whether this combination makes for a safe and effective treatment that has a favourable and long-standing outcome 8 years postoperatively. The main issues addressed in this study are the long-term effect of these procedures on the following: (a) the recurrence rate, (b) shoulder function and mobility, and (c) the patients’ ability to return to the pre-injury level of daily and sporting activities. The hypothesis formulated for this study was that the combination of these soft tissue procedures, is safe and effective in the long-term. This is a retrospective single-centre study based on prospectively collected data. The study included patients who were treated primarily for recurrent anterior shoulder dislocation and they all had engaging Hill–Sachs lesions (arthroscopically proven) and the inverted pear appearance of the glenoid was not observed during arthroscopy. These patients were operated on in our department between 2007 and 2012 and they were treated with arthroscopic Bankart repair and remplissage. During this 6-year period, 66 patients were primarily treated through arthroscopic remplissage in addition to the classic Bankart repair. Among them, 65 (98.5%) patients met the inclusion–exclusion criteria for participating in this study (Table 1). Their demographics data are depicted in Table 2. There were 56 males (86%) and 9 females (14%), with a mean age of 30.1 ± 7.6 years (range 17–47 years). Furthermore, 42 (65%) of them had right and 23 (35%) had left shoulder injuries. The dominant side was injured in 41 (63%) patients. Fifty-two patients (80%) were involved in sporting activities of different types and levels, while 13 (20%) were not involved in any sports activity. Among those who were routinely involved in sports, 40% participated in competitive sports, whereas 60% were recreational athletes. All the patients had more than one pre-operative dislocation; 14 patients (22%) had less than 4, and 51 (78%) had experienced 4 or more dislocations. The average age of the patients during the first dislocation was 20.6 ± 5.3 years (range 12–38 years). A standard physical examination was performed preoperatively to record the range of motion (RoM) and check-ing the positive apprehension test. All the patients in this series showed a positive apprehension sign when the arm was abducted at 90° and externally rotated. The American Shoulder and Elbow Surgeons (ASES) score, the modified Rowe score, and the Oxford Instability score were applied to evaluate the shoulder function. The radiological evaluation included two standard anteroposterior views (in internal and external rotation) to demonstrate the presence of a Hill–Sachs lesion and possible degenerative changes. Hill–Sachs lesions were also identified and measured utilising preoperative axial MRI images. Additionally, a 3D CT scan was performed for all the patients to analyse the glenoid defect according to the method described by Sugaya et al. .Although all of the patients were clinically examined pre-operatively and had undergone three-dimensional computed tomography (3DCT) and magnetic resonance imaging (MRI) for the calculation of their bone defects, it was the intraoperative assessment of the defect that was the critical factor in the decision-making process of whether to combine remplissage with the standard Bankart repair. Patients who had engagement of the humeral defect to the glenoid rim during the dynamic examination were included in this study. Engagement was considered positive when the Hill–Sachs lesion engaged the anterior aspect of the glenoid with the arm in 90° abduction and the shoulder externally rotated at 90°. The glenoid bone loss was calculated pre-operatively and measured intra-operatively. No patient in this series had a glenoid bony defect greater than 25% or an inverted pear appearance of the glenoid. All the operations were performed by a single senior surgeon (EA) in the lateral decubitus position with an arm traction of 3–4 kg under the inter-scalene brachial plexus block in addition to general anaesthesia. A diagnostic examination of the glenohumeral joint was initially carried out to confirm the presence of the Bankart lesion, measure any glenoid bone defect, evaluate the tissue quality of the anterior capsule, confirm and calculate the size of the Hill–Sachs lesion and detect any other concomitant pathology. The anterior inferior glenoid radius was measured, and the severity of the glenoid bone defect was quantified as the percentage of the normal inferior glenoid diameter. The posterior radius of the inferior glenoid at the level of the bare spot multiplied x2 was considered as normal. The Hill–Sachs lesions were evaluated according to the criteria presented by Calandra et al. . The dynamic evaluation completed the diagnostic part of the arthroscopy. With the traction removed, the arm was abducted and externally rotated to observe whether the Hill–Sachs lesion engaged the anterior glenoid rim. Subsequently, viewing from the antero-superior portal, the anterior labrum–capsule complex was mobilised, and a double-loaded absorbable anchor was inserted in the glenoid rim at 5 or 7 o’clock (for the right or left shoulder, respectively). The sutures were passed through the anterior labrum and the capsule without being tied. The Hill–Sachs lesion was abraded with a burr, and one or two double-loaded anchors (depending on the size of the defect) were inserted into the lesion through a postero-lateral accessory portal. Utilising a suitable suture passing instrument, the sutures were passed through the posterior capsule and the infraspinatus tendon in the mattress configuration and tied over the lesion, thus creating a firm contact between the capsule–tendon complex and the humeral head (Fig. 1). Finally, the anterior complex was repaired by tying the knots of the already inserted anchor and implanting additional anchors as required (usually 3 double-loaded anchors in total).Intra‑operative findingsEvery patient had engaging Hill–Sachs lesions. The glenoid bone loss was confirmed in all the pre-operatively predicted cases (49 cases—75%). The Calandra arthroscopic classification  was used to evaluate the severity of the Hill–Sachs lesions and 34 patients (52%) had grade II lesions and 31 patients (48%) had grade III defects (Table 3).Postoperative rehabilitationThe operated arm was kept in a sling for the first 6 weeks, but the patient was allowed to remove the sling for passive exercises or performing daily activities. However, movements were restricted to the front of the body (90° of forward flexion, internal rotation towards the belly, and no more than 10° of external rotation). The patients were examined every alternate day for the first week, once a week for the follow-ing month, and monthly thereafter. Assisted active exercises were started during the 3rd postoperative week, increasing the RoM gradually and turning to active exercises on the basis of the patient’s progress. Overhead activities and con-tact sports were allowed after 6–9 months following surgery, depending on the progress of patient rehabilitation and the level of participation. The patients were evaluated at 3 and 6 weeks and 3, 6, and 9, and 12 months post-operatively and every year thereafter. Re-dislocation, subluxation, or a positive apprehension sign after surgery was defined as a failure of the treatment. Any residual pain or other complaints were documented. Apart from the patients who suffered a re-dislocation (3 patients), 11 patients (18%) were lost to follow-up, and in the end, 51 patients (82%) were available for evaluation. The average duration of follow-up in our series was 8.1 ± 1.8 years (range 5.6–10.6 years).A standard physical examination of the shoulder and an evaluation of its function with the ASES score, the modified Rowe score, and the Oxford Instability scores were recorded by a shoulder surgeon from our department, not by the operating surgeon. The shoulder RoM was measured utilising a goniometer. The strength was evaluated with the arm elevated to 90° in the plane of the scapula elbow straight and the palm facing the floor, employing an electronic hand-held dynamometer (Lafayette Manual Muscle Tester, Model 01163, Lafayette Instrument Company, USA). The patient was asked to resist for 5 s, and this procedure was repeated three times to record the average power. Radiographs, including standard antero-posterior views in internal and external rotation, were routinely obtained in case of com-plications. MRI was not performed routinely, and only a few patients had a follow-up MRI due to the limitations of the Medicare system. When MRI was available, the healing of the infraspinatus–capsule complex within the humeral compression fracture was evaluated. The capsule-myo-tenodesis was considered as healed when the tendon was in contact with the bony bed of the Hill–Sachs lesion and no gap was observed in the T2-weighted image (Fig. 2).Approval was obtained from the Institutional Review Board (IRB) of IASO General Hospital of Athens (ID number: 96/2013) according to the official guidelines of the Declaration of Helsinki. Informed consent was obtained from all the individual participants included in the study. Continuous variables were reported as the arithmetic mean and one standard deviation and discrete variables as the arithmetic mean and range. In cases that data was asymmetrical (functional tests), median used instead of mean. All arithmetic mean or median values were presented with no more than one decimal, while the method adopted for the measurement of RoM allowed no decimals. The Wilcoxon matched-pairs signed-rank test was employed to evaluate the differences between the preoperative and postoperative RoM and functional scores, since the distribution of these data did not meet the assumption of normality. For all analyses, p < 0.05 was considered to be statistically significant. Since this is a retrospective study, no ad hoc calculation regarding the required sample size was performed. We included all the eligible patients who were treated between 2007 and 2012 according to our inclusion–exclusion criteria. Three patients experienced a re-dislocation; one of them suffered it at 13 months postoperatively owing to a low-energy injury. The second patient felt on his outstretched arm in abduction and external rotation while descending stairs 12 months after surgery. The third patient dislocated his shoulder while practicing windsurfing 4.5 years post-operatively. The overall failure rate was 5.6% (3 out of 54 patients). The remaining patients were satisfied with the results. They had all returned to their previous daily routine by the last follow-up session. The average active forward flexion was increased by 10° (n.s. ), from 170° ± 25.4° preoperatively to 180° ± 1.8° during the last follow-up session. External rotation at 0° of abduction was increased by 6° (n.s. ), from 74° ± 22.8° pre-operatively to 80° ± 11.1° during the last follow-up, while external rotation at 90° of abduction was decreased by 3° (n.s. ), from 89° ± 25.3° to 86° ± 9.2°. Finally, internal rotation was at the T10 level (range T6–L2) preoperatively and remained at the same level (T10) (range T7–T12) at the last follow-up (Table 4).The comparison of the operated shoulder with the other side in regard to the shoulder’s external rotation found a difference up to 10% in 7 patients (14%). This RoM difference was not accompanied by significant complaints neither everyday nor in sporting activities. Overall, all the scoring systems applied revealed a statistically significant improvement during the last follow-up in comparison to the preoperative scores. The ASES score was increased by 27.5 units (p < 0.01), from 72.5 (range 18–100) preoperatively, to 100 (range 85–100) in the last follow-up. The modified Rowe score also increased by of 60 (p < 0.001), from 40 (range 15–70) preoperatively to 100 (range 70–100) in the last follow-up, and the Oxford Instability score was increased by 19 units (p < 0.01), from 29 (range 9–47) preoperatively to 48 (range 36–48) during the last follow-up (Table 4). The average external rotation strength of the shoulder increased by 1.7 kg (n.s. ), from 9.1 ± 2.9 kg preoperatively to 10.8 ± 1.6 kg by the last follow-up. One patient developed ulnar nerve palsy, which gradually recovered within 6 months by following conservative management. Other complaints referred to, especially several years after the operation, was a clunking feeling, early fatigue after activity, and weather sensitivity, but these had no influence on the patients’ daily activities. With regard to sporting activities, 36 out of 51 patients (71%) continued to participate in sports, most of them at the same level of competence. The most important finding of this study was that the clinical and functional outcomes of the operative technique described do not deteriorate with a longer follow-up. The possible explanation of this finding is that recurrences due to wrong indications or technical errors occur during the early stages. This is the period when the patients “have forgotten” their surgery, have no residual complaints (pain or stiffness), while simultaneously the follow-up and the rehabilitation program come to an end. The outcome after 2 years of follow-up can be considered almost consolidated. Any new dislocations that may occur after this period is rather due to a new high energy injury rather than being related to the operative technique adopted.The recurrence rate in this series is 5.6%. The respective rate in the literature fluctuates from 5.4 to 11.8% [4, 6, 15, 23, 32]. Only Boileau et al. have reported a 2% recurrence rate, but in this study, patients with substantial glenoid defect were excluded . However, the description of the engaging Hill–Sachs lesion by Burkhart , the concept of the glenoid track developed by Yamamoto et al. , and the on-/off-track lesions described by DiGiakomo  reveal that it is the combination of the bony lesions (glenoid and humeral side) that is responsible for the instability pattern observed in these patients and not each lesion individually. Bone defects are a major factor that a shoulder surgeon takes into consideration in cases of instability, but it is not the only factor. The age of the patient, his sporting activity (type of sport and competitive level), the age at which the first dislocation occurred, the number of dislocations, and the inherent laxity of the patient’s joints are other parameters that are also taken into consideration by the surgeon when deciding the treatment plan.This decision-making process is based on the principle that by increasing the stabilising factors, we expect a lower recurrence rate, and we believe that this can be achieved in three steps. The first step is to restore the anatomy of the anterior (inferior) glenoid labrum, which is the essential lesion for anterior shoulder instability. Thus, arthroscopic Bankart repair is the first line of treatment and can be considered as the final treatment for simple cases of instability. When the surgeon is not satisfied with the results of this technique, he should proceed to the second step, that is the reduction of the volume of the posterior capsule , which can be achieved through arthroscopic remplissage. The combination of these two steps (arthroscopic Bankart repair and remplissage) can be an adequate solution, stabilizing the shoulder in the majority of instability cases . However, when the stability achieved is not satisfactory, soft tissue procedures seems to be inadequate. Thus, the surgeon can continue to the third step, which is the bony augmentation of the anterior glenoid by performing arthroscopic (or open) Eden–Hybinette or Bristow–Latarjet . We strongly believe that this is the algorithm that the surgeon follows to choose the appropriate method for the management of anterior instability cases.Under arthroscopic visualization we had the impression that the plication of the posterior capsule was more effective when was done from the humeral side rather than the glenoid side. 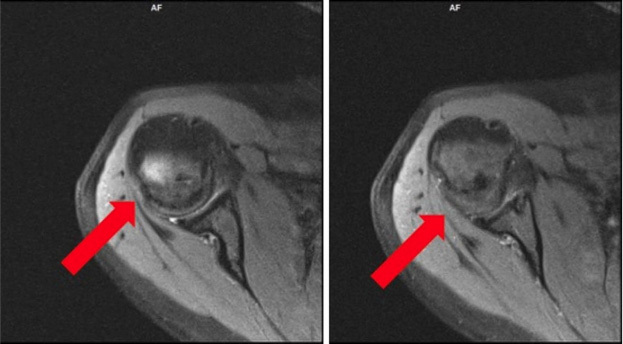 Thus, the anchoring of the posterior capsule and the infraspinatus tendon within the humeral bone lesion pro-vides a strong fixation due to the scar tissue that is created, and the healing evidence from the MRI (Fig.2) implies that this is constant after the passage of a long period. Consider-ing this, we can assume that the remplissage stabilises the joint through two mechanisms. The first mechanism is pre-venting the engagement of the Hill–Sachs lesion on the glenoid rim, rendering the lesion extra-articular, and the second is by acting as a posterior restraint, controlling the excessive anterior translation of the humeral head . Consequently, the force acting on the repaired anterior capsule is decreased, the risk of postoperative re-dislocation is reduced, and the stability is maximised.Since this is a non-anatomical procedure, many authors have raised concerns regarding the restriction of shoulder motion and the return to sporting activities. The average postoperative external rotation deficit at 90° of abduction in the literature ranges from 1.9° to 8° [2, 4, 6, 10, 32]. A biomechanical study has also reported an external rotation deficit of 11.7° . In our series, the external rotation at 90° of abduction was decreased by 3° from the pre-operative measurements. This finding was neither statistically nor clinically significant, since there was no significant restriction reported in everyday or sporting activities. Furthermore, 14% (7 out of 51) of the patients reported a subjunctive difference in their arm’s external rotation as compared to the contralateral side but without any restriction in everyday or sporting activities. The difference between the two sides was measured in these patients and was found to be less than 10% compared to the contralateral side. Seventy-one percent of the patients were engaged in sporting and overhead activities of different levels during the last follow-up. The reasons provided by the patients who were not engaged in any sporting activity were irrelevant to their shoulder function. These data support the possible functional adaptation of the operated shoulder with a ‘rebalancing’ between the scapulothoracic and glenohumeral motion .The advantage of this procedure is that it can be applied for the vast majority of cases of instability cases and not only for the management of Hill–Sachs lesions. The criteria for the borderline cases should be defined in future stud-ies, because at present, it is mostly based on the surgeon’s preferences. The incidence of glenoid bone defects greater than 25% is 4–8% in multiple studies [14, 24, 27, 28, 32]. Furthermore, bony procedures, such as the Bristow–Latarjet, are non-anatomic and technically demanding  Moreover, they may lead to serious complications, such as graft mal-positioning, neurovascular injury, graft fracture, non-union, screw breakage, and osteolysis , with an overall complication rate of 15–30% [16, 21, 22, 26]. Consequently, the need for glenoid grafting should be rather infrequent. However, these procedures are very popular, since they pre-sent very good results with very low recurrence rates . Moreover, they are considered the “gold standard” by many surgeons for the management of shoulder instability .Nevertheless, this study has several limitations. This study is a retrospective one, and there is no control group with a Bankart repair alone. The preoperative and postoperative evaluation of the patients were performed by the authors and not by independent observers. No interobserver or intra-observer reliability regarding the values of the functional subjective scores or the RoM was measured. However, the physicians were experienced shoulder specialists, while the clinical tests as well as the functional subjective scores used, are well-established in the literature for their accuracy in the postoperative follow-up of patients treated for recurrent anterior shoulder instability. Moreover, it should be considered that none of the surgeons who participated in this study was the originator of this procedure and that strict criteria were followed to establish its efficacy and safety.The clinical relevance of the present study lies in the fact that most cases with recurrent anterior instability can be managed with soft tissue procedures. Our results support an extension of this procedure’s indications, thus reducing the need for bone grafting procedures. This should be applied carefully, considering each individual’s characteristics that increase the probability of recurrence and not focusing only on the severity of bone defects. The combination of the arthroscopic infraspinatus tenodesis and posterior capsular plication (remplissage) with the classic Bankart repair was proven to be a safe and effective procedure for the treatment of “engaging” Hill–Sachs lesions when an inverted pear appearance of the glenoid is not observed during arthroscopy. In the long run, this combination results in a low recurrence rate, without significantly influencing the RoM of the shoulder. Funding The authors received no financial support for this study, either from pharmaceutical and industry companies or from other institutes. Conflict of interest Emmanouil Brilakis; Grigoris Avramidis; Michael-Alexander Malahias; Apostolos Stathellis; Anastasios Deligeorgis; Ioannis Chiotis; Elias Mataragas; Efstathios Chronopoulos and Emmanouil Antonogiannakis declare that they have no conflict of interest. Ethical approval Approval was obtained from the Institutional Review Board (IRB) of IASO General Hospital of Athens (ID number: 96/2013) according to the official guidelines of the Declaration of Helsinki. Informed consent Informed consent was obtained from all the individual participants included in the study.